If you do not want to make any mistake when buying a drone, then the DJI Mavic 2 Pro is the way to go. 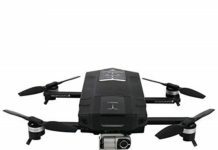 Coming hard on the heels of the Mavic Pro, the first foldable DJI drone that was introduced into the market in 2016, Mavic 2 Pro is incredible. By this, we mean that it meets all professional photographers and videographers needs. 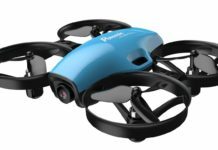 Since it is quite small and foldable, it’s great drone to travel with. Since its launching as the professional drone within its size range, it has become the bar setter. For some years to come, other drone makers might be trying to match up. But this is not strange at all since DJI is known for making trendsetting consumer drones. It is small and compact, good for traveling, it does not occupy much space in your travel pack. It packs a powerful camera though, a Hasselblad. You will capture high-resolution 1080P videos of your outdoor rendezvous. Although small, it comes with many features, all of which are a bar higher when compared to those of the other drones within this range. Even the flight time has been extended, as you will see later in the technical features segment. 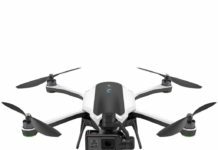 This powerful drone is designed with the needs of professional photographers and videographers at heart. Take the DJI Mavic 2 Pro out of the box and the first thing you will notice is the beautiful modern sleek design. It comes in a dark grayish angular body. Some of the noticeable features include the four foldable rotor arms, a camera slung at the front and the battery compartment at the back. This drone is built for stability and durability. It is also compact and light in weight – at only 907g. When it is fully folded, it can fit perfectly in a small bag. The other thing that you will notice about this drone is that it comes with all the necessary accessories that you need for flying. 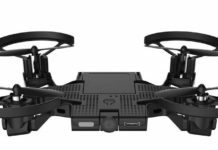 In the package, you will get six propellers, a remote control, a battery, a charger and a USB-C cord. In addition, there are cords for hooking the remote to your smart device and a detailed user’s manual. When it comes to the camera, the DJI Mavic 2 Pro is fitted with a Hasselblad L1D-20c camera that captures first class quality aerial photos and videos. The camera is a product of a renowned Swedish brand, which has been making world-class cameras for decades. It is able to capture HDR photos and 4K video footages. The camera is equipped with a 20MP 1-inch CMOS sensor that is able to capture more details in every single pixel. Many people wonder whether the large 1-inch sensor is any better with only a 20MP camera. The truth is that when you have a larger sensor, you need lower MP. That way, you get a high quality image. In poorly lit conditions, the sensor enables the camera to capture images with reduced noise. In addition, it has an adjustable aperture that enables it to handle various light conditions. In very bright conditions, the aperture stops down to limit the amount of light intake. This ensures that the images are not exposed too much to light to the point of losing important details. Because of all the above camera features, this drone is able to capture exceptionally impressive photographs. The photos and the video footages have a dynamic range and color depth. This is something that you don’t usually get to see in most camera drones. You can be sure that the photos will not be grainy at all. Using HLG, you can plug in the Mavic 2 Pro into a 4K TV thanks to the 4K 10-Bit HDR function in the camera. You can watch all of your footage on TV if you like. For the storage of your captured images and videos, the drone has inbuilt 8 GB internal storage which you can expand. It has a microSD card slot that is able to support cards of up to 128GB. With the help of the USB-C port, you can transfer the images and footages to your computer. 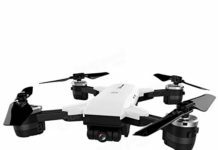 The expandable storage is yet another indication that this is a professional drone, targeted at professional photographers and videographers. The next impressive feature of this drone is its powerful battery. When it is fully charged, the battery gives you an impressive 31 minutes of flight time. This is an eye-popping miles ahead of its peers in this size range. 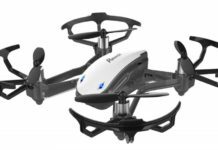 Being a consumer drone, this is quite incredible since most of its rivals offer between 18-25 minutes of total flight time per charge. While on flight, this drone performs very well. It is fast and highly responsive. 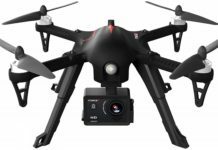 It has a3-axis gimbal system that allows it to remain steady while on flight. This means that even when shooting videos and photographs of moving objects, the footage will not be grainy. Able to achieve a maximum speed of 72km/h when it is not windy, you wonder whether this was meant to be a racing drone. That is not all … it is equipped with the advanced DJI low-noise flight technology that enables it to remain quiet while on flight. This is quite a helpful feature since it ensures that you do not distract or capture the attention of the people around you when flying your drone. For enhanced safety while on flight, this has been designed with the Advanced Pilot Assistance Systems. It also has obstacle sensors on every side. This helps the drone to read, recognize and cautiously avoid every obstacle in front or behind it, preventing it from bumping on them. It also a mode that enables the pilot to switch easily from the very fast Sports mode to the very slow Tripod mode within seconds. The controller is user-friendly and responsive. According to DJI, it can control your drone within a range of 8000 meters. It is also sleekly designed with a LED screen and a convenient phone holder. This drone is easy and fun to fly. It is robust, fast and its image quality is so good even when I take videos in windy conditions. It is stable in air and it does not crash into obstacles. Herman G.
This is a costly drone, but after a couple of months of using it in my photography business, I think it is definitely worth it. I would not recommend it for beginners or kids though. Lauryn S.
The DJI Mavic 2 Pro is made with the needs of professional pilots in mind. Therefore, it is ideal for professional photographers and videographers who would love to take their profession to the next level. Its camera that is able to capture professional quality photos and videos. 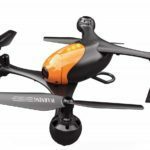 Since it is also user-friendly and uncomplicated to fly, it is also a perfect purchase for the novice pilots who would want to venture into aerial videography and photography. Due to its robust construction, it can handle most of the abuses that are bound to happen with beginners. 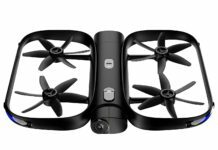 If you would love to explore longer distances – up to 8km, this drone can do that kind of flight range and still return to the controller. As you have already seen from the above review, the DJI Mavic 2 Pro is a serious, professional drone. It has many improved features such as the extended battery life, obstacle avoidance, high quality camera and quiet operation. It is fun to fly, cute and compact courtesy of the foldable rotors. Although you have to dig deeper into your pockets to own one, it is worth every dime you spend on it. This is the real deal quadcopter.